Ohio lies within a temperate climate zone and experiences cold winters across the state. Eastern Ohio offers mild summers, while southern Ohio has the warmest summers and the lengthiest growing season. If you live in Ohio, select berry trees according to mature size, bloom information, general culture and intended use. Various berry tree varieties perform well in Ohio landscapes. The downy serviceberry tree (Amelanchier arborea), sometimes called the juneberry or the shadbush tree, belongs to the rose family (Rosaceae) and thrives in eastern Ohio. Mature trees range from 20 to 30 feet in height. The serviceberry features attractive, gray bark and hairy, pale green leaves that frequently turn deep red in the autumn. White flowers bloom in April and May, followed by edible, red to purple fruit that matures in June. Serviceberry trees handle a variety of lighting and moisture conditions, but prefer acidic, well-drained soils. Ohio gardeners often plant the serviceberry tree in lawns and along streams. 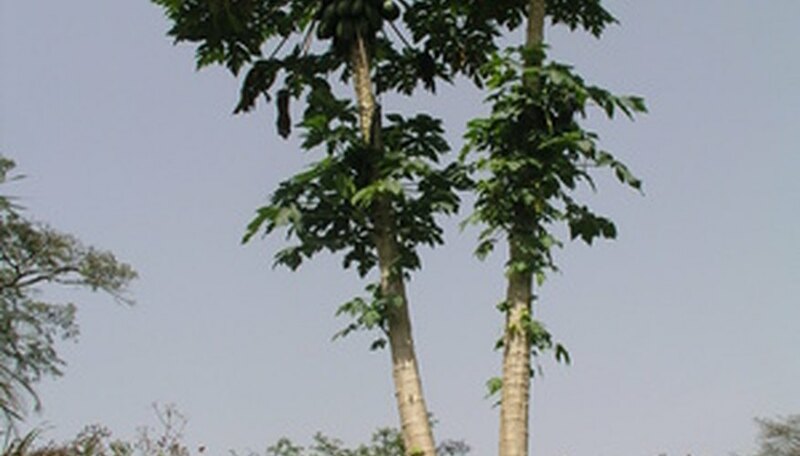 Pawpaw trees (Asimina triloba), also called Indian banana trees, belong to the custard-apple plant family (Annonaceae) and perform well in north and south Ohio. The pawpaw tree features non-showy, purple to brown flowers that appear in April and May, followed by edible, brown berries shaped like miniature bananas. This tree also bears vibrant green leaves that take on yellowish-green tones in the autumn. Mature pawpaws range from 10 to 40 feet in height. This berry tree tolerates various lighting conditions, but likes moist, acidic soils. The pawpaw works well as an understory tree in Ohio landscapes. The common hackberry tree (Celtis occidentalis) naturally occurs in southwest Ohio. Mature trees reach between 30 and 50 feet in height. This elm family member (Ulmaceae) bears rough, gray bark, crooked branches and dull green leaves that turn non-showy, yellow shades in the fall. Greenish-white flowers appear in April and May, giving way to clusters of sweet, red to purple berries in the winter. This tree tolerates various lighting conditions, but prefers moist, rich soils. The common hackberry performs well as a shade tree. The red mulberry tree (Morus rubra), sometimes called the moral tree, belongs to the Moraceae plant family and reaches up to 50 feet in height. This mulberry variety bears flaky, gray to brown bark and hairy, green leaves that turn vibrant yellow shades in the autumn. Small, white to green flowers appear in May, followed by edible, purple berries that mature in late summer. This native Ohio tree likes the moist, rich soils in the central and southern parts of the state. The red mulberry performs well planted along rivers and stream banks. The sassafras tree (Sassafras albidum), an aromatic member of the laurel family (Lauraceae), reaches heights up to 40 feet and likes the dryer soils in south Ohio. This berry tree features green leaves, reddish-brown bark and yellow to yellow-green flower clusters that appear in April and May. These blossoms give way to glossy, deep blue or black berries that mature in early fall. The bark and roots are often used to make sassafras oils and teas. The sassafras tree likes moist, acidic soils in Ohio woodlands.